The Resource Revolution refers to a new technological revolution in how we run our economies, industries and companies. It follows the earlier Industrial Revolution and its phases of mechanisation (1770 – 1840) and urbanisation (1880 – 1920) in the industrialised world, as well as the Green Revolution (1930 – 1970) world-wide. Authors from McKinsey (2014) have referred to it as the biggest business opportunity of the century, highlighting how for example information and communication technologies (ICT) can be employed to advance more integrated systems and circular approaches to how living and non-living resources are used. It involves paradigm change and disruptive innovation in the delivery and use of new technologies, enabling what some would call a new Kondratiev cycle of prosperity driven by the spread of new, cleaner technologies and structural economic change. Importantly, it involves decoupling of economic growth from both resource use (resource decoupling) and negative environmental impacts (impact decoupling) as described by the International Resource Panel (IRP 2011). This builds on industrial ecology, management and design approaches such as factor ten, zero waste, life cycle thinking and biomimicry, scaling it up to build circular economies that use less resources per unit of economic input and reduce the environmental impact of any resources used or economic activities undertaken. Redefining the way we think about products and services, including product-as-service systems and sustainable lifestyles, it poses innovation challenges to improve the lives of growing and urbanising populations in both industrialised and developing societies. In developing communities, it involves working with entrepreneurs and start-ups in reverse innovation and bottom-of-the-pyramid business models, supported by new business ecosystems and markets that enable delivery at massive scale while respecting the notion that “small is beautiful”. 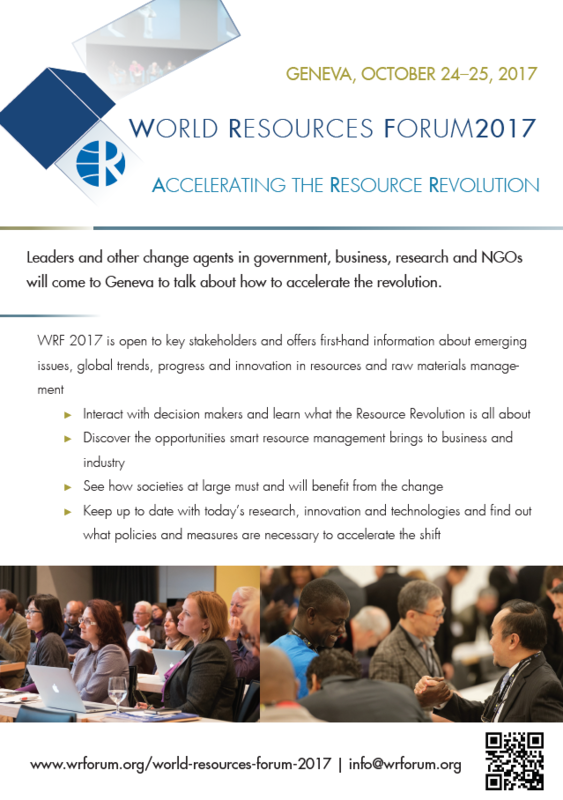 ► WRF 2017 was open to key stakeholders and offered first-hand information about emerging issues, global trends, progress and innovation in resources and raw materials management. ► Interaction with decision makers and learning what the Resource Revolution is all about. ► Discovery of the opportunities that smart resource management brings to business and industry. ► Keep up to date with today’s research, innovation and technologies and identification of policies and measures that are necessary to accelerate the shift. Two sizzling days of plenary debates, partner workshops, scientific sessions, exhibition, press conferences, WRF Cinema, Art Gallery, and social program, including the famous WRF Gala Dinner. In short, the signature WRF format, carefully designed to deliver open and involving multi-stakeholder dialogue.